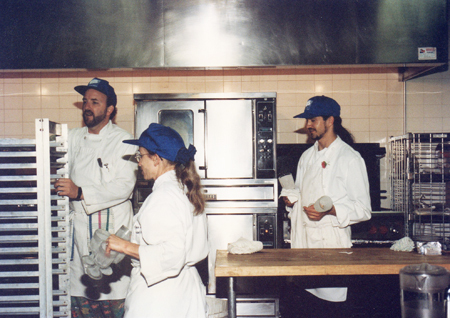 By the end of March 1995 I had completed eight out of ten quarter classes required to receive my Certificate in Professional Cooking and my Certificate for Pastry and Baking at UCLA. I had also completed the nine month 185 hour internship for Cooking at Campanile and another 150 hours internship at another restaurant for Pastry. I had been going to school at night for four years and it had become a way of life. I didn’t want it to be over, so I decided to take the cooking class that was part of the Catering Certificate Program. Just to keep my hand in. The Catering cooking class was held upstairs in the Tea Room at Bullocks Wilshire near UCLA. No longer used as a restaurant, it was rented out for events and classes like ours. It had a huge professional kitchen and a dining area with a very 1930’s feel. 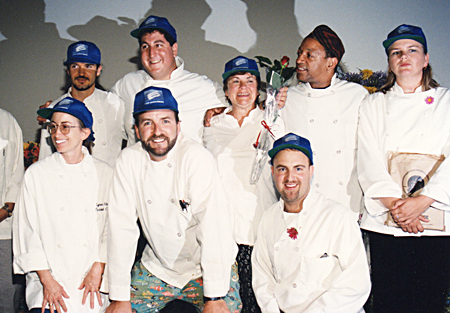 This class was taught by Denise Vivaldo, who at the time owned a very successful catering company. I never would have imagined that almost 20 years later, she would be the most preeminent food stylist on the planet and I would be a food blogger who would once again be taking classes from her about food styling. Here is our Class Photo taken after the banquet. We were so proud and happy! That’s me on the front left. 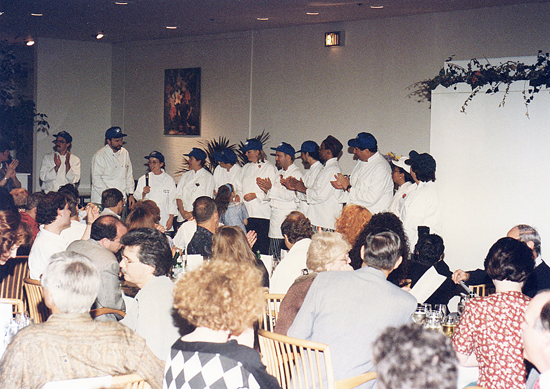 The first night, Denise explained that the first hour of class would be devoted to how to run a catering business. The estimating, costing, paper work. She gave us handouts and we took notes. The rest of the class time in the kitchen would be devoted to deciding what we would be cooking for our final, which would be a banquet for 100 friends and family. We would be trying dishes that we brought from home or cooked in class. If there were some ingredients we wanted, she would make a list and bring them to the next class. Next she explained that we would be working on a brigade system and now we were going to pick the people we wanted to fill those roles. The other students were all in the Catering Certificate Program and had taken their first cooking class together, so they knew each other and what their cooking skill levels were. Nobody knew me from Adam. So Denise asked who they wanted to be our Executive Chef. Everyone started yelling,”Brian! Brian! Brian for Executive Chef!” He was a line cook in a hotel restaurant and their hero. They went on picking people for Sous Chef, Purchasing Agent, Event Planner and Publicist. All the positions were filled and everyone was looking happy and satisfied. Well, then I raised my hand. Denise gave me the nod and I said, “I also want to be the Executive Chef.” Everyone turned around and looked at me like I was an alien. A big purple one with eyes on stalks. Poor Denise thought this part had been solved so easily. She rubbed her nose and said, “Well, why don’t you and Brian both be Executive Chefs and you can divide up the duties between you.” So that was arranged. I really wanted to run the show and make sure everything happened the way it should. OCD. Here I am the day of the banquet. Very Serious. Long ponytail. Their reaction to me made perfect sense. They didn’t even know if I could cook. So I devised a plan to win them over, show my cooking skills and cook my recipes at the banquet. The next class I made some of my famous Twisted Cookies and brought them with me to share. I put the box in the middle of the table and told everyone to help themselves. No pressure. Well, pretty soon they were all scarfing them down and telling Denise that we had to have these cookies at our banquet. The next week I brought some little sourdough toasts and a white bean spread, Kalamata Olive Tapenade and a Kale Pesto. They were munching all through the lecture. Finally someone said, “Will you give us the recipe for these for the banquet?” Sure no problem. This went on for every class, plus I was creating dishes during the cooking part of the class. The only recipes that weren’t mine were the Crudités, Dips, Asparagus Salad and Melon Soup. I ended up making Beurre Blanc white wine sauce for a hundred people that used seven pounds of butter, and the red wine Demi-Glace sauce. 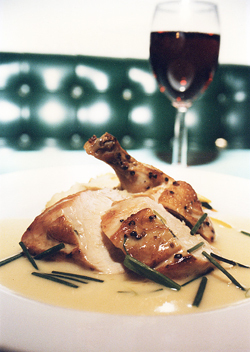 Also the chicken recipe with the parsnip mashed potatoes was one of Campanile’s signature dishes. I always chuckle to myself when I think about how the kitchen manager and other prep cooks at Campanile thought I had no skills, and here I was duplicating their famous dish for 100 people. 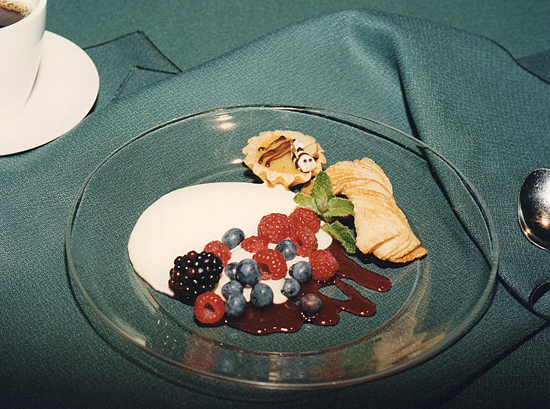 I made the Sabayon and Raspberry Coulis there the day of the banquet. Also on the plate were a Twisted Cookie, Gingersnap Cookie (underneath) and a Mini Lemon Tartlet with the Buttercream Bee, all of which I made at home for 100 people and brought with me. After the dinner was finished and the dessert served, all of us students were asked to come out into the dining room and take a bow. They wanted me to walk out first and all of a sudden somebody handed me a microphone and told me to make a speech. I don’t remember what I said, although I recall it was something lame about thanks for coming and I hoped they enjoyed it. The Dean of the Hospitality Department stood up and made a congratulatory speech and then he said he thought the dessert was magnificent. All of the guests stood up and started clapping and cheering. I almost fainted. Everyone was patting me on the back and saying how they loved the little bees. One lady said she was taking the bee home to give to her little daughter. I felt so happy! A disclaimer on the photos: These were taken by someone who had been drinking wine, with a film camera, and recently I scanned them into my computer so they are now digital. Not the best, but they give you the idea. 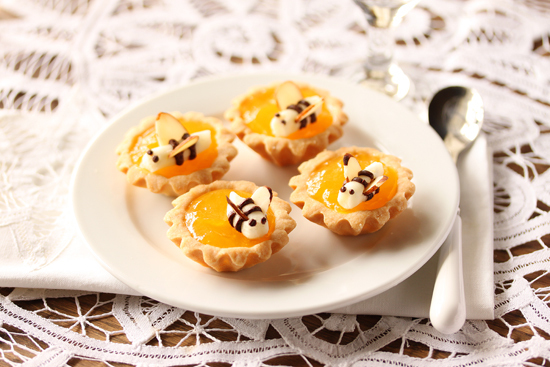 There are two additional posts on how to make the little buttercream bees and how to make the mini tartlet shells. The recipe for my favorite lemon-lime curd is below, but you could fill the tartlet shells with any flavor curd, chocolate pudding or mousse, ganache, banana slice with vanilla custard, sweetened cream cheese and berries. The list is endless. Feel free to be creative. 1. Place 2 inches of water in a large sauce pan and bring to a simmer on the stove. 2. In a large stainless steel bowl, whisk the egg yolks and whole eggs together until no egg white can be seen. Add the sugar, juices and zests. Whisk together until thoroughly combined and no longer feels grainy. 3. Set bowl with egg mixture on sauce pan with simmering water. Make sure the bottom of bowl is not touching the water. 4. Using a pot holder to hold the bowl steady, whisk continuously until bubbles disappear and the mixture resembles thick hollandaise sauce, 5—10 minutes. This mixture will not curdle, so don’t be afraid to cook it until it is very thick. 5. Pour mixture through mesh strainer into a medium bowl. Cool completely before covering the surface with plastic wrap and refrigerating. Lemon curd can be made up to a week in advance and refrigerated. 6. 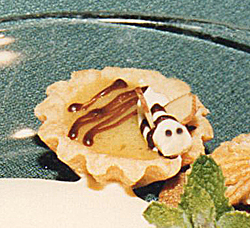 Pipe or spoon lemon curd into tartlet shells. Drizzle with melted bittersweet chocolate, if desired. 7. If not to be eaten the same day, store in a single layer in airtight container in refrigerator up to 3 days. Hi Lynne, I stumbled into your blog through Foodbuzz and found it to be amazing. I am going to ask my son to read too as he is in Culinary School at the moment. Love your mini lemon tarts, especially those bumble bees and the curd. How amazing is this…. I find it funny that in a sense good food has not changed and if you served this food now (15 years later) it would be seen as very en vogue if not still fashion forward…. Great Talent will be Talented in any age and time… the only thing that changed in these 15 years is the quality of photos. Whoa… very impressive!!! Fun to look back and see all that you have accomplished!! Hi Lynne, saw your picture on tastespotting… so cute , i love those little bees. I love the story and your boldness. Kudos to you for being the co-executive chef. I really enjoyed the pictures, of course love menu but being a dessert lover I’m crazy for the those tartlets. The bee is so cute and such a creative touch. Lynne: What a beautiful post. The bees are beautiful, too. You are incredibly bold, and I love it! Would you consider that a baseline trait in the food industry? Do meek personalities get by in this business? Is OCD mandatory? P.S. We went to Seasons52 on Saturday night for dinner. It was DELICIOUS! Already looking forward to going back. I can’t believe you can get all that food for less than 475 calories per dish. My favorite part: the piano bar. Lynne, your lemon tarts look delish & I loved reading about your culinary history. Denise is such a wonderful gal & I am so happy to have met her (& you!) at Camp Blogaway earlier this year. Those little tarts are adorable. And you can just see the work that went into making them so special. Those are such cute tarts!! Would like to make these for our annual “Highland tea”. I would be filling the shells around 7:00 am with lemon curd and custard. How long will they hold up without getting “soggy”? Our second seating is not till 1:30.